I enjoy starting seeds indoors in the dead of winter, but sometimes it seems like a lot of work. That’s why I direct sow (i.e. plant the seed directly outside) as many things as possible in the garden because it’s so much easier than starting plants indoors and cheaper than buying them from the store. 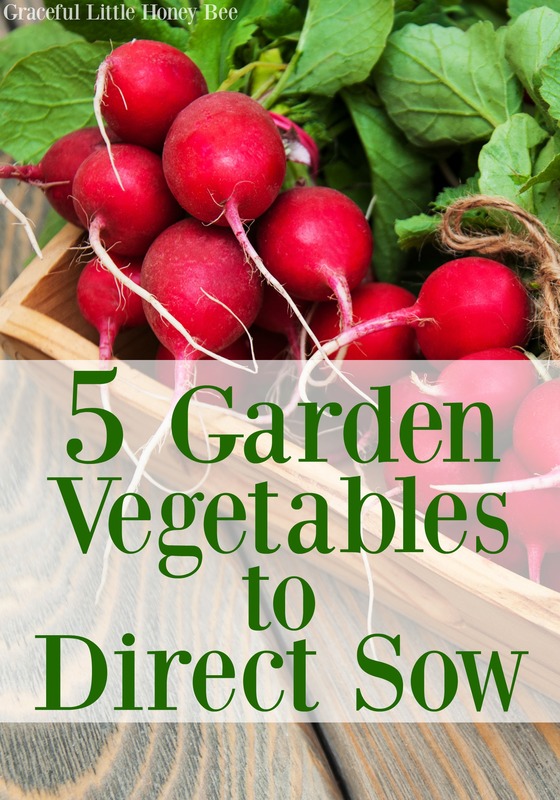 Today I’m listing my favorite garden vegetables that can be sown directly into the ground. Enjoy! I love growing cucumbers because they’re so easy and produce fruit really quickly. They’re pretty prolific so unless you plan on canning or preserving them 3-4 plants should be plenty for fresh eating. They’re a vine so you will need to trellis them. Seeds should be planted in the ground after the danger of frost has past. Most varieties take 50-60 days until harvest. Corn is a fun crop to grow because it grows tall really quickly. Also, nothing tastes quite like fresh sweet corn slathered with salt and butter. I should mention though that you only get 2-3 ears per stalk so if you have a small space it may not be the best crop for you to grow. Seeds can be sown directly into the ground around the time of your last frost date. Squash and zucchini are both crops that can be sown directly into the ground around the time of your last frost date. They grow quickly and can be pretty prolific so take that into consideration when planting. You may also need to watch out for powdery mildew and squash bugs. Moist varieties can be harvested after 50-60 days. Radishes are a fast growing cold weather crop that should be planted in the ground 4-6 weeks before your average frost date. Succession plant (every 2-3 weeks) for a longer harvest period. Most salad varieties take only 30-40 days until harvest. Beans are really easy to grow. You can plant either a bush or a pole bean. If you choose the pole bean then you will need to have a trellis that it can grow up. I prefer the pole bean because it can be kind of hard hunting for beans all over the ground with the bush varieties. Seeds should be planted in the ground after the danger of frost has past. Most varieties take 50-70 days until harvest. Obviously there are many more crops that can be direct sown, these are just a few of my favorites. If you’re reading this and have never started a garden before then I would highly encourage you to do it this year. There is nothing more rewarding than putting a seed into the ground and watching it grow into food to feed your family. Squash seems to grow like a weed here in NJ. Direct sowing them here makes perfect sense. I can start a zucchini seed in late June and still get plenty of production by mid august.